Thank you very much! You are awesome! Hello everyone! I'm just starting out on creating a project utilizing my hydra's but I've been running into some problems that I just can't seem to figure out. 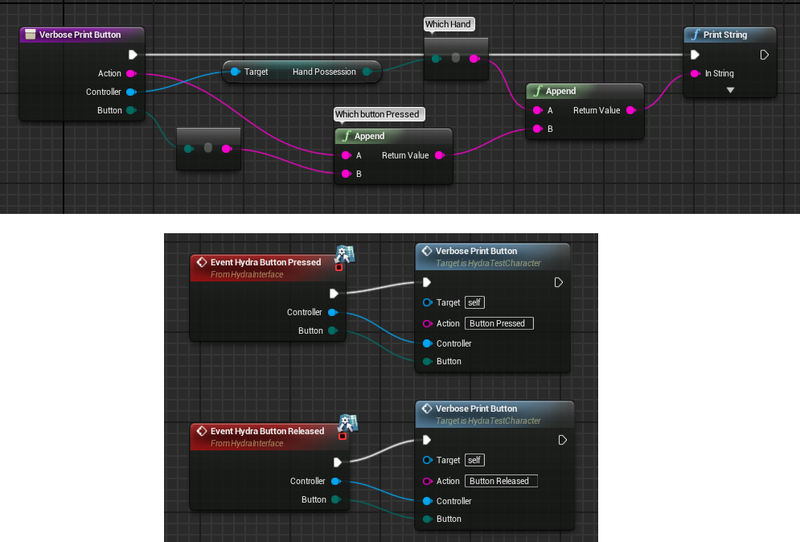 I tried following along the video that Getnamo posted on how to use the plugin inside ue4 and I'm stuck on the part where you draw the debug sphere's utilizing the positional data and trigger pull event onto the screen. 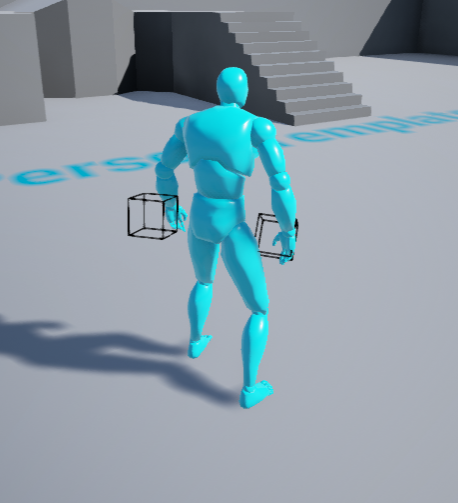 I started a brand new 3rd person blueprint project and copied over the plugin and binaries folder to the project root and everything seems to function correctly except for the debug drawing node. I'm able to print out the coordinates for the hydra positional data but just can't seem to get past that. Also as a side note, not sure if the latest update took away one of the blueprint functions or not but for some reason I can't seem to get the Hydra Get Latest Data function to come up no matter where I put it. If anyone could help me get past this that would be awesome!! I'll have to grab some screenshots of what I have setup but I've done this about 10 times straight now and I haven't had any changes so far in getting the debug spheres to work correctly. Much appreciated! @aialexander, I've had several requests of an example recently, but don't have anything that's readily shareable, so I'm going to try and get what I have ported over into the VR game template so that there's something I can point to. Hopefully by sometime tomorrow or maybe early in the week. The plugin has had a fairly major change, I recommend using the component setup as this is considered the standard form since 0.7. Please follow the 0.7 post for setup. That said the other convenience actors do work the same, but instead of 'latest data' it is now called 'latest frame'. You can pull up all available functions/events by typing in 'Hydra' when you right click. If you're using the component system remember that the function calls happen on the component not on the parent blueprint. I've had similar problems with drawing the debug spheres, I can only get them to work in a reasonable fashion after I've multiplied the position vector data by 50 or 100. I'm not sure why that is but I've gotten it to work that way. How are you setting the radius of the debug spheres? Are you using a static variable or do you have it mapped to the trigger buttons' axis value? You might have to raise that value as well just to be able to see your spheres. I tried using that before but it's different from how I see most of the other screenshots on here look. There isn't the huge list of functions on the right side like how it looks in this screenshot here and I'm wondering if it was broken up into smaller chunks to help clean some of the blueprints up. Also I did follow along the new 0.7 instructions on my test project and still no difference in getting stuff to work. I'll have to try multiplying the positional data like aialexander suggested to see if that works at all with the draw debug sphere. Just thought I would bring this up while posting since I haven't read anywhere that it's been taken out or separated out is all which was confusing while I was trying to follow along some examples people have posted. Last edited by cleerusher123; 10-29-2014, 12:35 AM. Notice the duplication of work and you can't confidently say that controller 0 is left hand and 1 is right hand, which would require double the branching logic compared to the event driven version to confirm. In addition unlike the event version, the positions will report even when docked, which is usually unnecessary. This exact reference is emitted from every event so you can check other things from within the event context without resorting to any polling. The reason for this change is mainly adding the whole controller relevant information in events, which also includes the ability to check which hand the controller is in from any context while still to providing the same functionality as before. This also makes the plugin upstream maintenance easier. Armed with this knowledge I would follow n00854180t's guide for IK setup in this thread, but use an event driven source. You could also have the IK setup turn off (alpha =0 in animgraph) whenever you dock, which would default the character to regular animation whenever the hydra isn't available. Remember that all Hydra properties and functions are categorized under 'Hydra' prefix so that you can see what is available from the node you drag by typing hydra and it will filter all your functions down to the plugin relevant ones. Edit: updated the main post, containing this updated example. Last edited by getnamo; 10-29-2014, 08:57 AM. So I heard that n00854180t is almost ready to post a tutorial for this stuff just as soon as he's done ironing it out! I'm excited! allowing for a single event to handle all buttons if desired. Thanks for the update getnamo, works great! Working on this next, expect an updated version by tomorrow. On a side note I'm also a backer of the new STEM system from Sixence, The vitualizer and the full body capture suit from Perception Neuron. Does anyone else here have any of these devices on order as well? I did not personally back them but wish I could have, however, I have my boss very interested in the virtualizer, and a definite buy when perception nueron is available......we have the legacy mocap suit on order now.